What is the horizon? 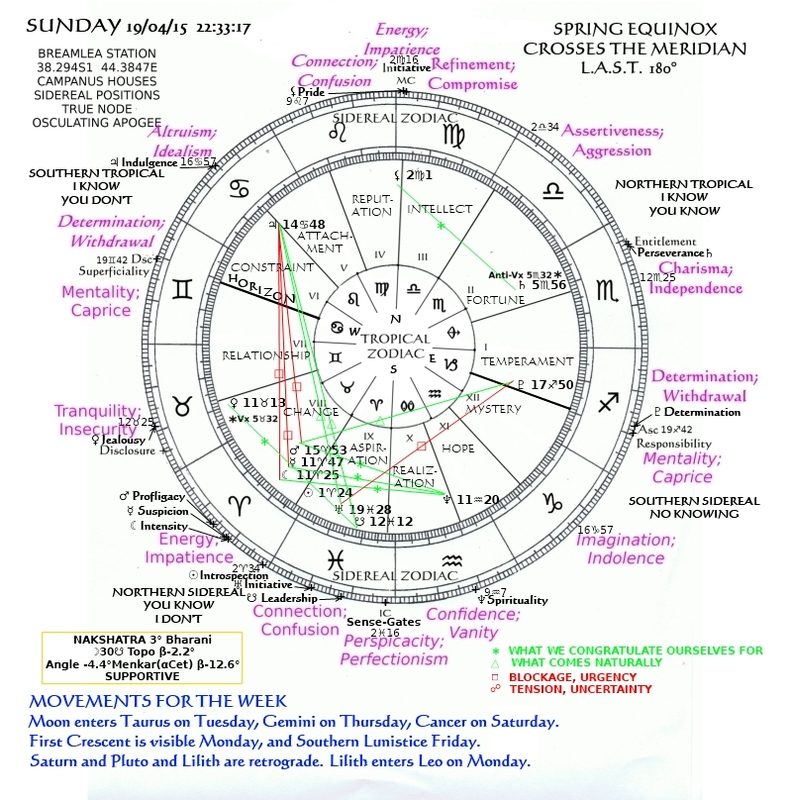 If it can be ambiguous in astronomy, with the complications of atmospheric refraction and extinction, and geocentric vs topocentric positions, astrology makes it even murkier. Is it the boundary between sleeping and waking, or the moment we assume our mask and enter the public stage? What is temperament? How conscious are we when we wake up? Is waking itself the assumption of a mask? 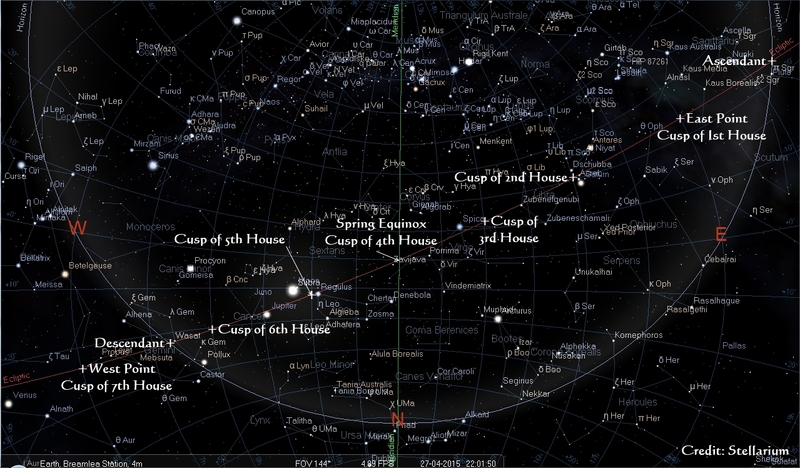 My usual house system is Campanus, which makes the horizon the 1st House cusp regardless of how far north or south of true east the Ascendant is, but I am attracted to the possibility that Meridian houses might give a more direct indication of the Zodiac’s orientation to the cardinal directions on the local landscape. 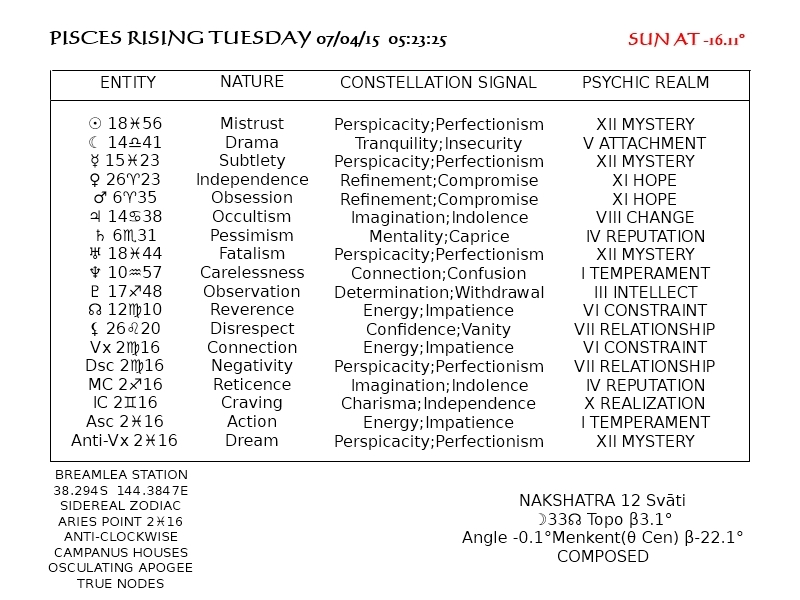 So here is a horoscope for the coming week which uses Meridian houses, and following it a graphic which shows why the questions above arise. 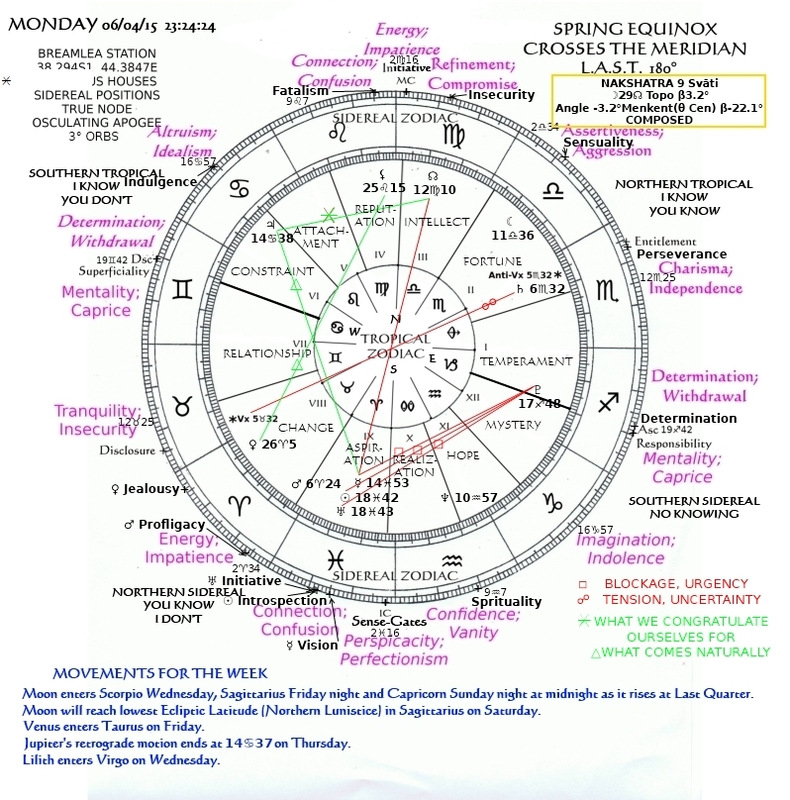 Every Full Moon cycle reminds us that a human life evades narrative by going around and around in circles and being indistinguishable from any other. Only evangelists talk of life being a journey, or people trying to sell you something. On the other hand, people have always learned to talk so they could tell stories, and every New Moon begins a new story like the one before, with an entirely predictable outcome. The next Full Moon will occur on the threshold of Deep Winter, and the Moon will be in Libra. This asks two questions. 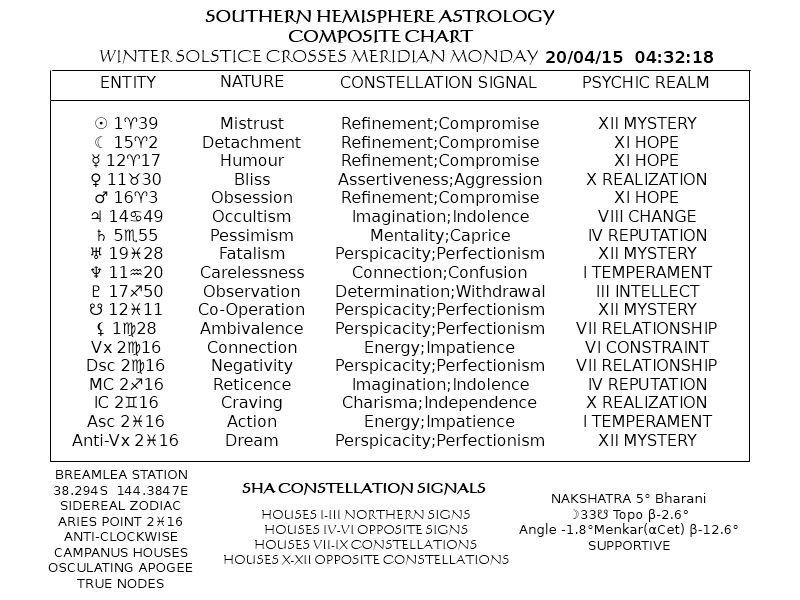 Does each Constellation have two opposite signs? And if men nurtured children from birth would seasonal similarities of personality be identifiable from the mirror sign? Where were we? Thank you. As I said, or meant to say, every story has the same meaning, whatever it relates. The New Moon is his realization that there is no journey. He took on board what the Sun told him back in Pisces and tried to transform it, embody it in the opposite Constellation and show the Sun there is always something she needs to learn from him, that her power fulfils itself in the arcane light of his campfire. Did he succeed? She is the judge, already telling him something else. I wouldn’t be surprised if she weren’t sending him on another errand into the night just to get him out of her hair. Building things is a lot harder than it looks. Cooperation is not just a matter of persuading others to help you get what you want, but helping others to get what they want when you want something else. The whole process of incessant negotiation to maintain commitment to a disintegrating idea by supporters of other ideas is exhausting and fraught with disappointment, the Moon has found. Perhaps it is better not to build, to appreciate what others are driven to achieve, but in the context of impermanence and undependability, see the redundancy of effort, be more reserved, more selective, more objective. Is that really what the Sun is saying, as she hunches into the cold weather? Stripped of its light, the Moon was a rock in space, no more. But that space! One of the joys of stargazing, space usually reveals itself only to the intellect, unless the dimensions of the universe are profoundly grasped. On this occasion it was palpable. The Moon shuddered huge in my night as a ship under its bunks shudders in deep seas. For that moment I understood the thrall of an eclipse to our ancestors, not only in its anxious challenge to a sense of order and in time the magnificent restoration of that sense by astronomy and mathematics, but in a bodily awareness of depth and mass and time and distance as one awful reality to make one’s very existence shudder, unmasked like the Moon. 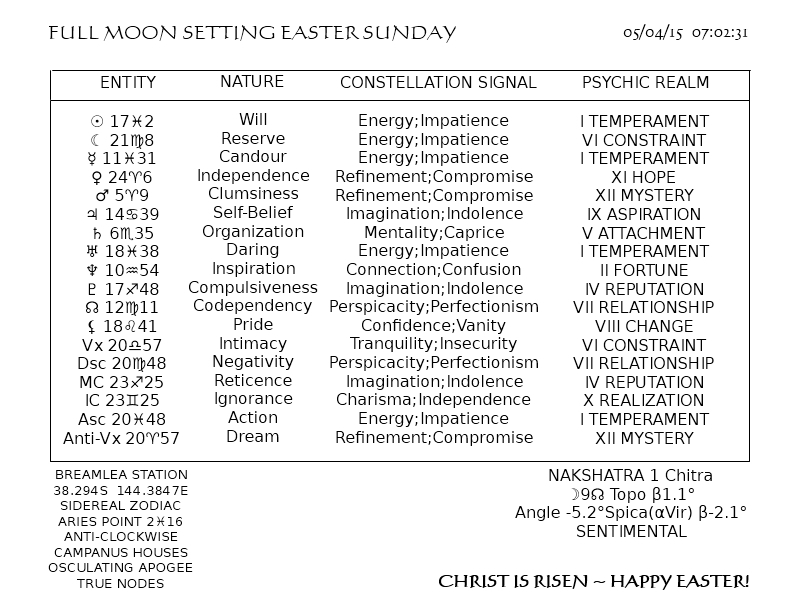 This post wonders what it is really about, although its occasion is clearly the Moon’s next crossing of the Ecliptic. Is the Moon a dervish reeling inebriated in the divinity of the universe? Has he learnt his gyrations, or is he just trying to stand up? What comes first, the Moon or its orbit? How in fact do Lilith and the Nodes tell us what they have to say about existence? 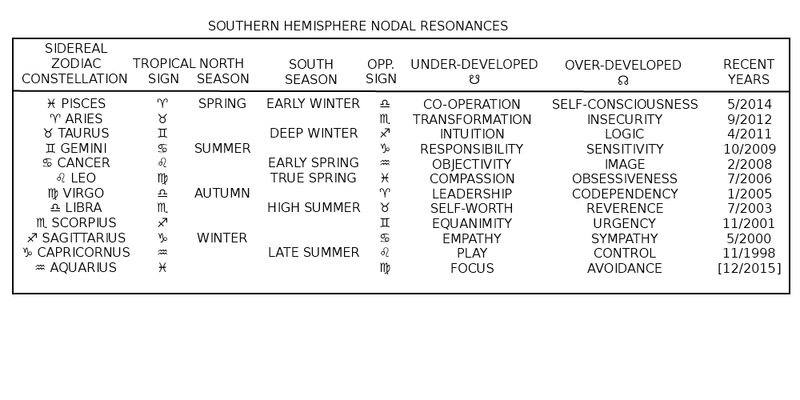 I know I’ve discussed this elsewhere, but in conventional astrology, the position of the Moon’s nodes indicate the karma which needs to be transformed, what is overdeveloped and what underdeveloped. When the Moon is below the Ecliptic, we are subject to the inherited, the habitual, the traditional. When the Moon is above the Ecliptic, we hear our calling and are exhilarated to heed it. Southern Hemisphere Astrology embraces this concept, but makes this day’s South Node the ascending one, or Dragon’s Head. 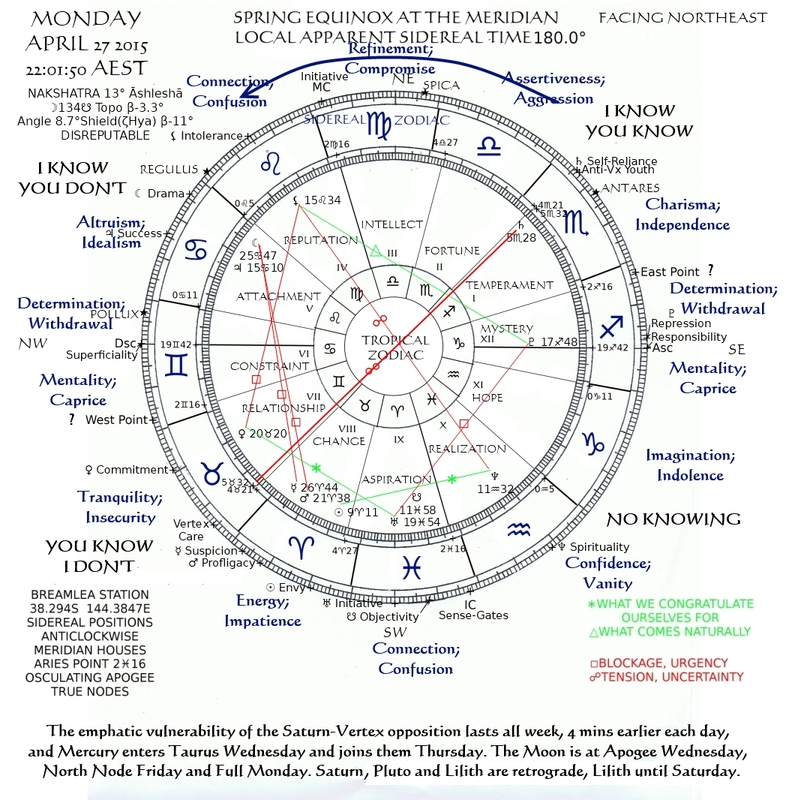 Of all the discrepancies between Northern Hemisphere Astrology and our antipodean experience, this is the most glaring. There can be no argument. However, it is not at all clear to me how any influence of the Nodes might manifest. Is it an important influence? 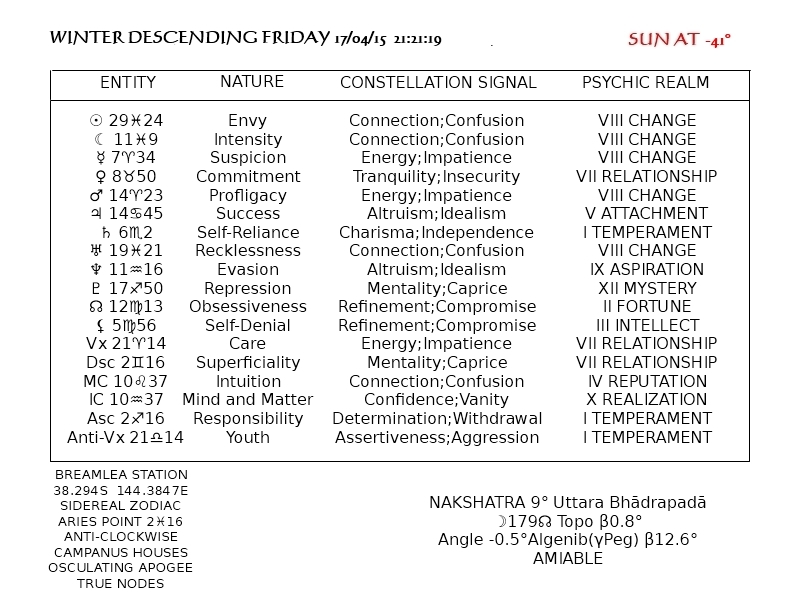 I have read several persuasive attempts to meld different manifestations of the obligation and transformation inherent in karma to the characteristics of the Tropical Signs. Unfortunately, even after turning everything right way up, I have a problem. It takes about eighteen months for the gyration of the Moon’s orbit to swing its nodes back a Sign. Attributing a nodal influence to Signs produces a static situation in which everyone deals with the same karma for eighteen months. Great for identifying generations, or universal moments in an unfolding of consciousness, if they’re your bag, but hour after hour, day after day? The elements of the Moon’s orbit are not static influences like Pluto or Neptune, but immediate and dynamic! 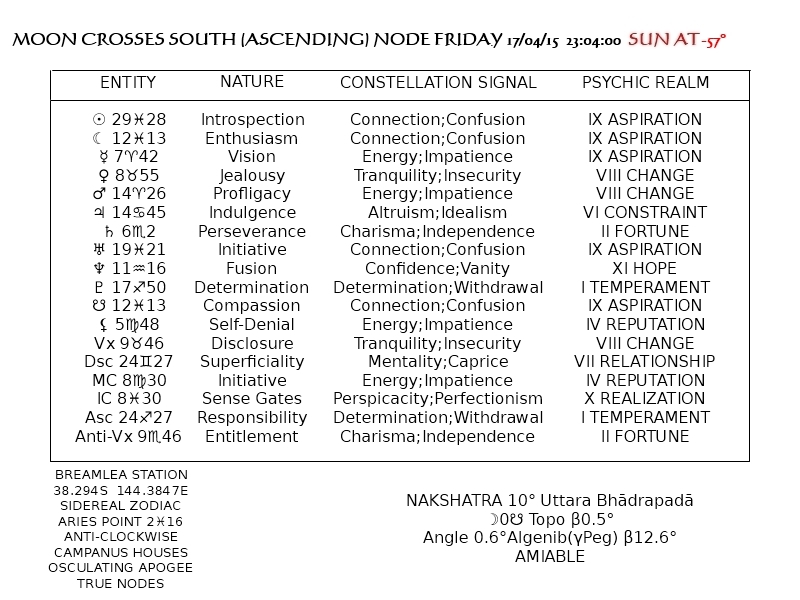 Trying to find psychic or spiritual resonances for what I can actually see in the sky, I really do look forward to the South Node for the uplift it presages. Watching the progress of the Moon in those terms, I chose at some point to respond to Lilith and the Nodes as elements of the Moon’s position. And so I have programmed my computer to generate results within parameters which are entirely arbitrary personal preferences, and which I could change at any time. But could I? Is it possible that confirmation bias has already clothed my light-hearted parameters as discoveries or inventions? Is this how astrology evolves? Is this how you can be so mired in error that the ludicrous colonisation of Southern skies by northern seasons continues? 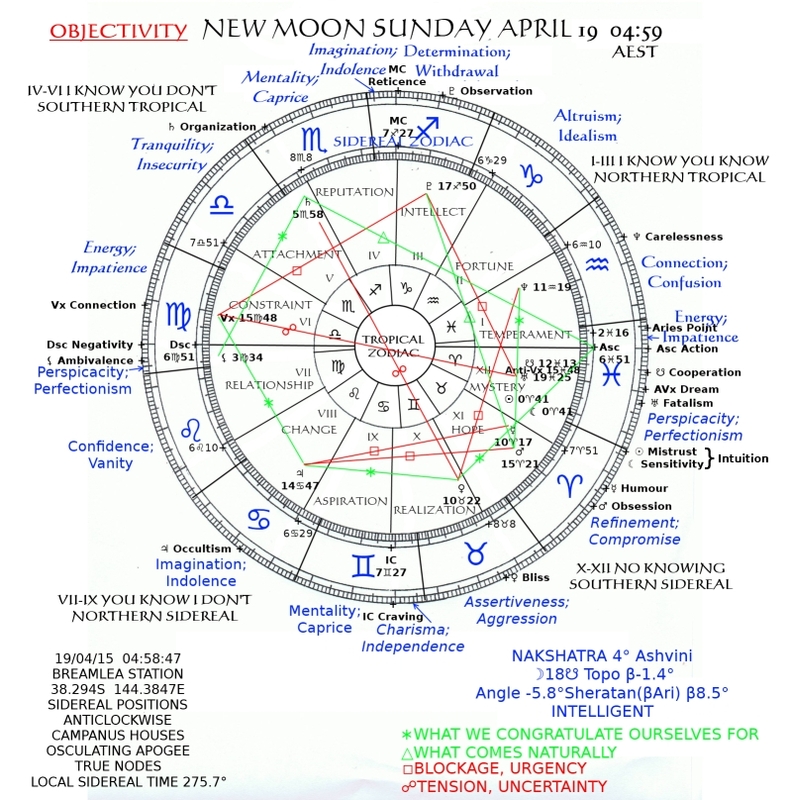 The following series of horoscopes for Friday April 17, when the Moon passes Perigee and South Node, shows how the nodal and apsidal influences morph as the Moon changes Sign and Quadrant. Like all my horoscopes, this presents the constituents of a situation so simply that you can as easily muse on the keywords and then evade them, as play with combinations of them and ignite a narrative of your choosing. The Moon is 30° before New; it is the middle of the night but only Saturn of the naked-eye planets is visible; Leo is low in the west, Scorpius high in the northeast. Lilith and the North Node are in conjunction in Virgo, which means that the Moon is at its most distant as it crosses the Ecliptic heading downwards. This sounds dreadful, but on the other hand, because it is heading downwards near the Spring Equinox in Virgo, the Moon will reach its lowest latitude at its highest declination in Sagittarius, which means it will reach its highest latitude at its lowest declination in Gemini, and there is some consolation in that. The question is, in what way are the nodes and apsides real? A Virgoan can be expected to adhere to fastidious solutions to separation’s implication of impurity, and Virgoan karma focusses on avoidance, but these points are in the Constellation Virgo, not the Sign. Libran qualities for Lilith would be vacillation and ambivalence in conventional astrology, converting to Arian irritability and pride in Southern Hemisphere mode. But let us ask the Moon! Does he conform to mathematical orbital rules, or does his mass and momentum swing his orbit around his waist like a hoop? 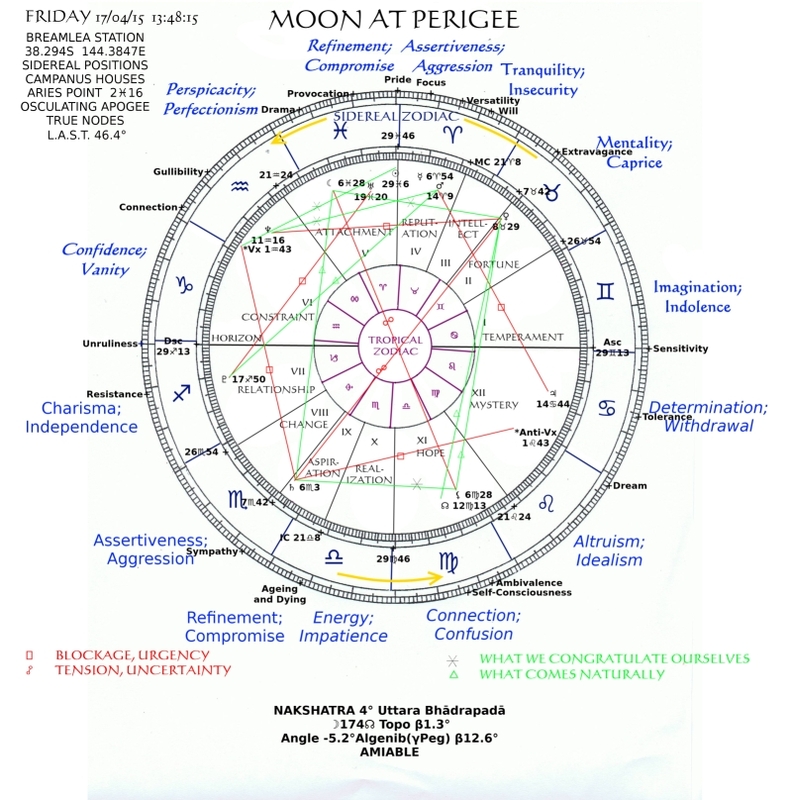 Above, he is in Southern Sidereal mode in the 4th Quadrant, a Leonian Moon with Leonian Lilith and Leonian karma. 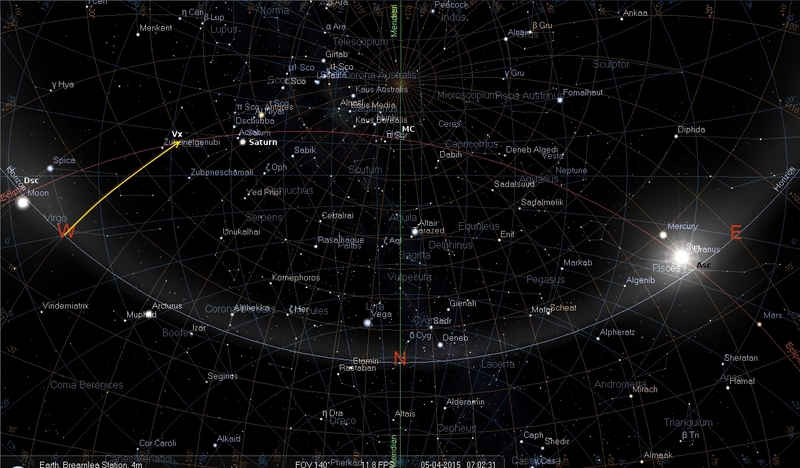 His nodes remain in Pisces and Virgo, but their effect is expressed by his latitude in the Constellation he is in. Below, in Northern Tropical mode, he is approaching an Arian denouement. 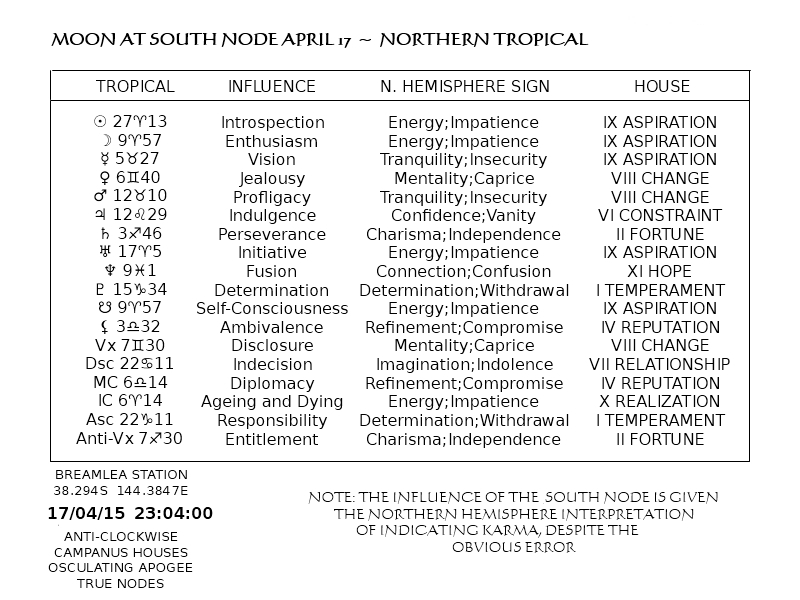 In the second Quadrant, The Moon juggles mirrored tropical influences, moving fast and about to boil over! 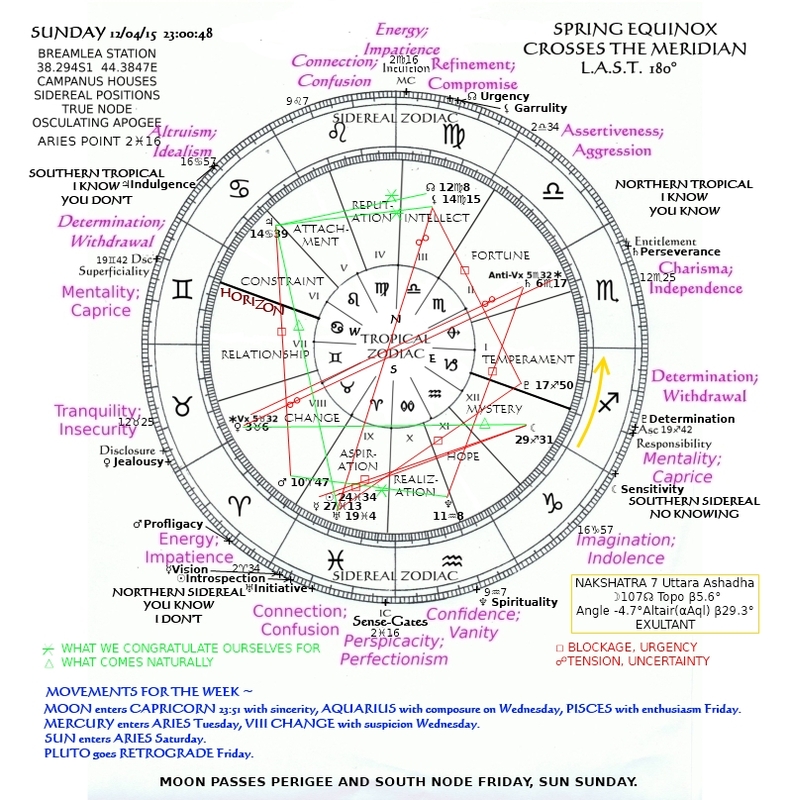 the Piscean nodal axis has something interesting to say about Librans. And finally, isn’t it self-denial that makes compassion (rather than sympathy) such a challenge for transplanted “Arians”? Postscript: The Ghost in the Machine, c’est moi! No sooner had the Moon expressed his internal grumble about the satisfaction-deficit of excess humility, than the clouds which had muffled his course for a week peeled completely from the early morning sky, the surf thundered encouragement, a great eagle soared up to accompany him, and his face blazed once more a youthful recognition of the world’s glory. You make a fundamental mistake if you look at the Moon and see only a reflection of the Sun. Do still look, lest you never journey beyond your opinions, and one day you may see, not a rock enmeshed in our spacetime, not a being of indeterminate age and gender shuffling away, but your own reflection earnestly ablaze with one question, what ought I be about? In The Sickness Unto Death, Kierkegaard identifies a state of existence you might recognize, the state of being without purpose, of being in despair. Is the Moon in despair? Is he ignorant of eternity, celebrating regularity, dedicated to escape? Of all the resonances, polarities and affinities proffered by astrology to serve as keys to the infinite, some but not all useless to unlock Southern Hemisphere shutters, I suggest you pay attention to the Nodes and to Lilith. In them you will find the Moon trying to follow his calling. The Moon, just like us, is a tiny entity in the scheme of things, swept off his feet by the gigantic power of the Sun, but of two compliments he is deserving, just like you: firstly, he never ceases to steer himself, even though the current be overpowering; and secondly, just look around, untold physical reactions pay homage to him here on Earth. He epitomises the activity of relating finite and infinite, of not just being conscious of the freedom he has in the system he cannot resist, but realizing himself in the doing of it. I hope in trying not to describe or explain too much I do not succeed only in mystifying the anthropic links drawn in my horoscopes between the ever-changing locations of the Moon, the Node he most recently passed, and the Apogee where in the instant he focusses on his folly and our fault. The Moon is struggling with disappointment. He lost face at the last Sun opposition, and his attempt to show how creativity and humility can wed was a flop. Heavy cloud obliterated his hunched progress through the foothills of Virgo and Libra, the treacherous ridges and cavernous gullies of Ophiuchus, and the dizzy crags of Sagittarius. He feels forgotten, and right now, with the bog of Aquarius before him, it seems pointless to assert himself. into the crags of a new week’s peak hour! I am trying to find an astrological system which encourages both an exploration and use of the potential of a moment, and an awareness of the illusory nature of form and perspective. You are young, and experiencing the awesome possibility that your loving might be destined to be returned by the one who embodies your highest ideals? I deplore the fashionable diagnosis of limerence, and any advice which is intended to stop you making a mistake. You are getting older, and life doesn’t seem to throw you as many options as it used to, or you have been crushed once too often, and now it seems that loneliness is easier to master than relationship? Come with me under the stars, try to feel the throb of the solar system in your guts, cherish your way, even as it bobs like a match in the spume. The Vertex seems vital to this mission. Its mystique emerges from the regularity of its behaviour on my horizon, kin to the seasonal markers of astrology in my hemisphere. 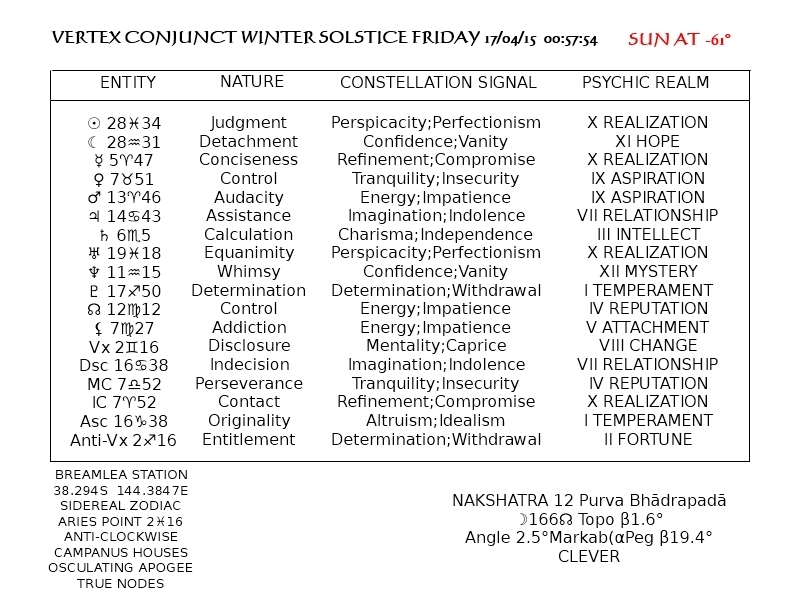 When it conjuncts the winter solstice it has gone as far as it can towards realization and still be conscious. 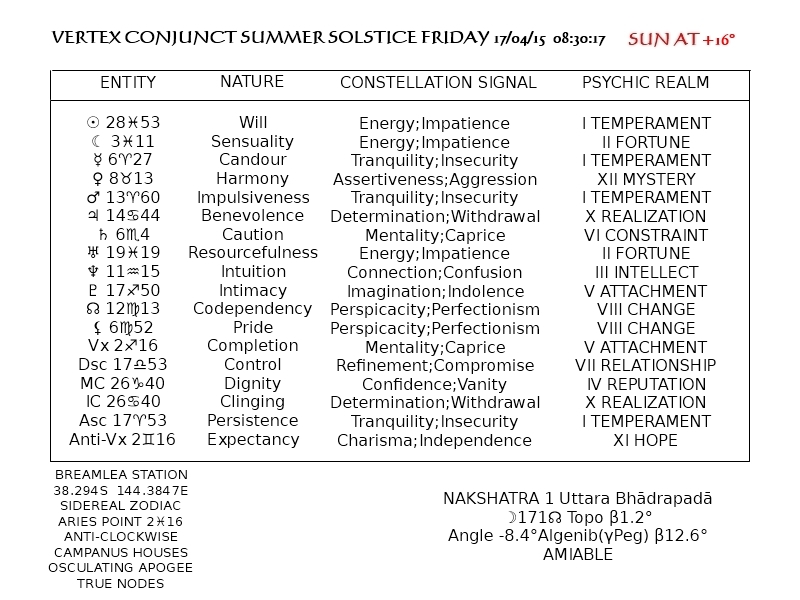 When it conjuncts the summer solstice, it has gone as far as it can towards publicity and still retain personal power. 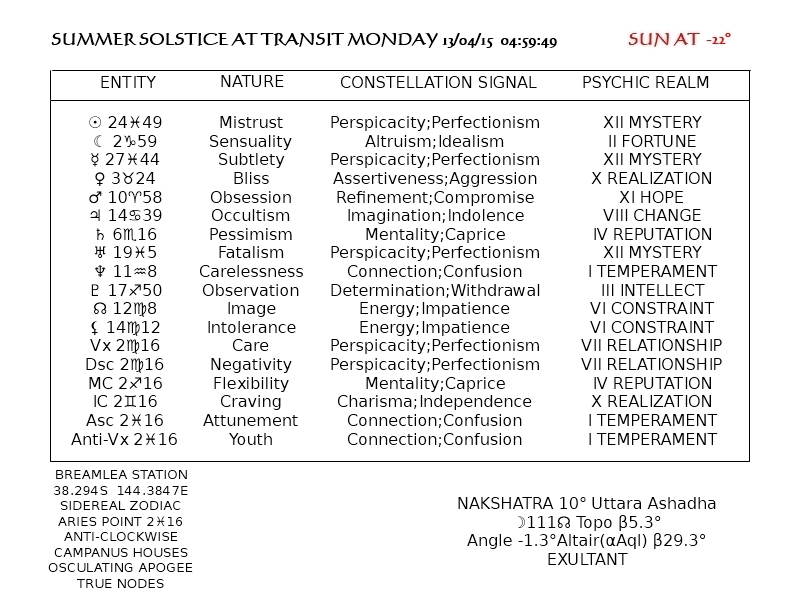 When either of the solstices are at midheaven the Vertex sweeps past the Descendant in instant disequilibrium, and the song of the hormones hears its echo. These moments are as regular as clockwork. They punctuate our waking and sleeping hours in precisely the same configuration of stars exactly 3mins 56secs earlier every day. What is a life measured in this way? And now the sotereological narrative of the Easter Passion again reaches its denouement. Millions are experiencing the cleansing of their sin by the awful suffering of the Divine made flesh, but billions are not, who think they have known suffering or are suffering now, without admission of the power of nameless love into the shrine of their wound. We stand at the Fifteenth Station, or the First. 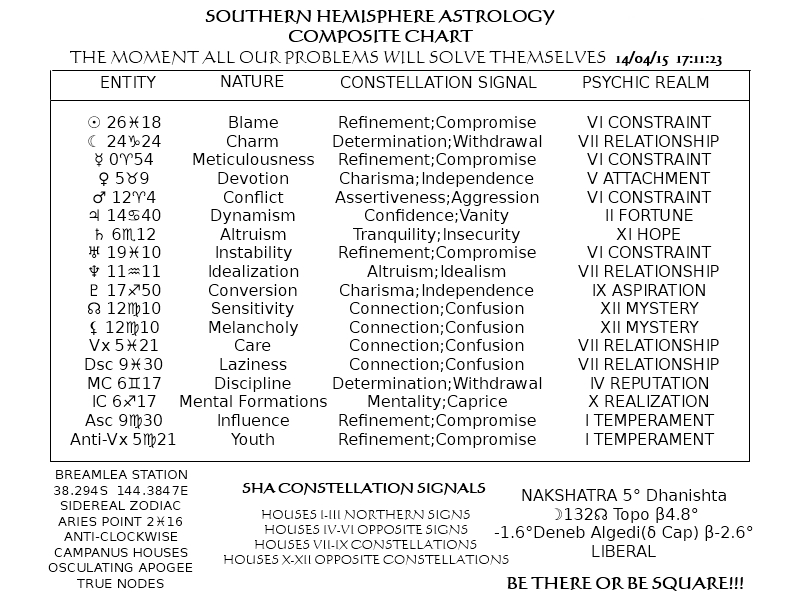 Do not believe what you’re told by the high priests of astrology, or any other rule. Feel it! what the Vertex actually ‘is’, and that astrological positions are geocentric, whereas Moonrise and Moonset times depend on the local conditions of observer angle to the Moon, its distance, and the refraction of light at the horizon, or in other words, topocentric position as shown here (in answer to the question, how can Moon position in the chart above be east of the Descendant, when it sets west of it? ).